The only way you can make money online is either through selling a product or a service. If you want to make money online there is no better way right now than selling your own digital software. It's what the highest earners are doing. Today on this page we want to give you the opportunity for the first time ever to reserve your place as a 'White Label Agency' member. 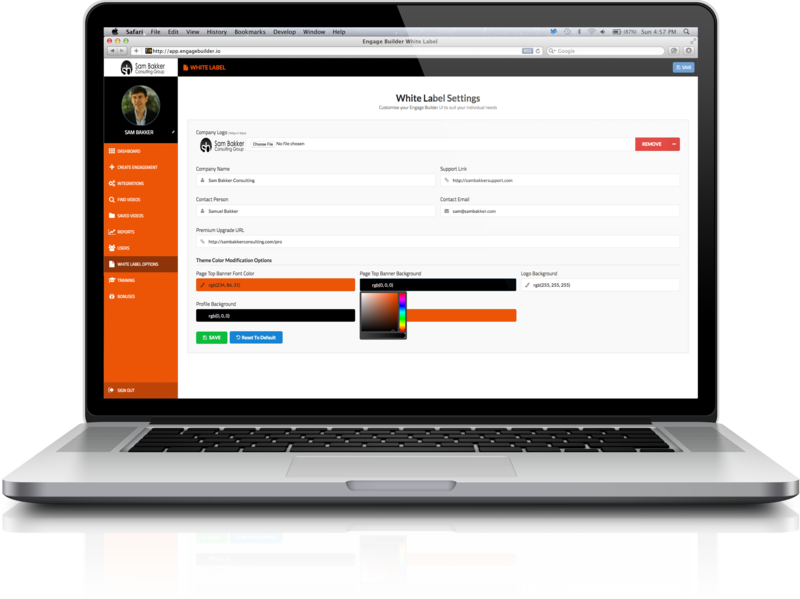 This White Label Agency membership gives you the ability to rebrand 'Engage Builder' as if it's your own. Over the past 2 years I've used this strategy to make over $1,500,000 in my business selling online. You can white label a product and sell it to your subscribers, Facebook fans, Instagram Followers or even JV with other marketers who want to introduce their subscribers to what you have on offer. Unlimited Videos - Your members can add an unlimited amount of videos to the software. No limitations, you're going to have very happy customers. Charge Extra For Pro Features - You can charge extra to customers of yours for PRO Features. You can rename the PRO features package something else and sell the features separately from within your White Label dashboard. PRO Features Marketing Material - You're going to get our OTO1 sales video, sales page and any marketing material that you need to help you to promote the upgrade package. Email Swipes - To improve your chances of selling the upgrade package we're going to give you a number of high quality swipes that you can use in your followup sequence to promote the upgrade. Add them into your autoresponder and you are away. Retargeting Ads For Facebook - We're also giving you all of the images you need to advertise over Facebook using Retargeting Ads. These ads will help target current customers encouraging them to upgrade. Add New Users - You can add new users from this dashboard within minutes after they've purchased. Edit Users - Edit users within this dashboard as you want. If they forget their password you can reset the password, you can edit any of their details as well. Delete Users - You can delete users easily within this dashboard. If someone stops paying monthy or yearly then you can cancel their membership. Manage Users - You can manage all of your users within this one easy to use dashboard. 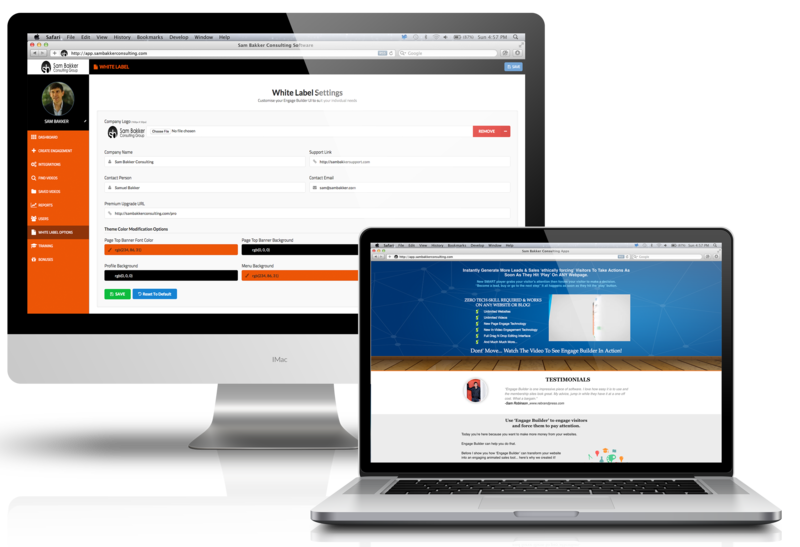 Your Own Salespage - You'll get our salespage that you can customize and make your own. Change our logo, change the branding. 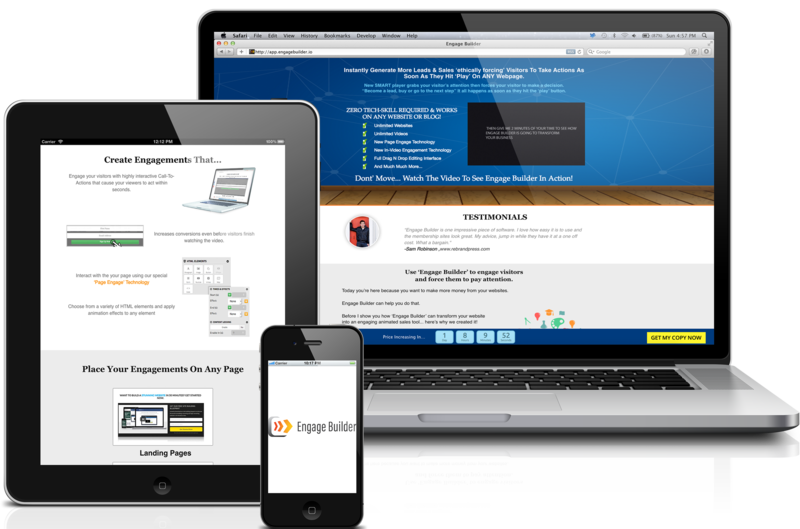 This salespage we've worked hard on to help you sell Engage Builder. 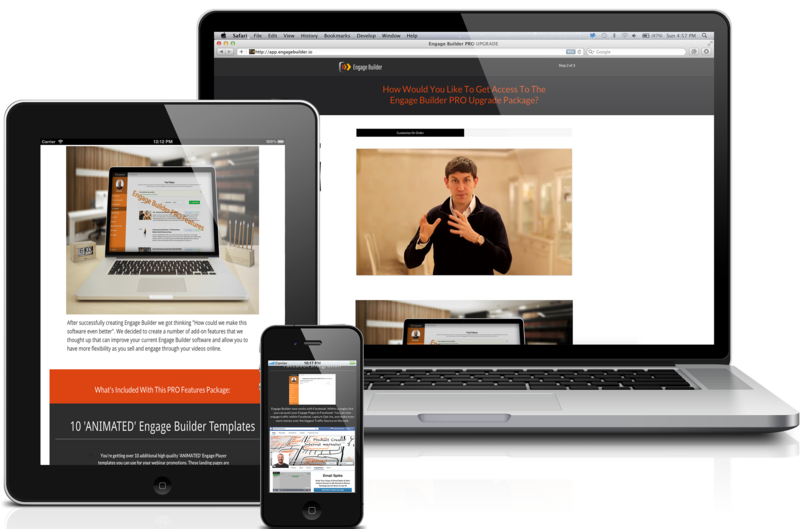 Your Own Sales Video - You're getting our sales video to use with your promotion of Engage Builder. If you'd like you can use your own or save time and use ours. Try our White Label package today, use it, sell as many copies as you want and if for whatever reason you're not thrilled by the results, let us know and we will refund your money 100%. Our support desk is ready to help you if you decide you want to use your 30 day money back guarantee. Billed yearly cancel anytime, no set up fee.